Adobo or adobar is the Spanish word for marinade, sauce or seasoning. I’ve heard references to adobo in several foodie shows now, which relate to a powdered seasoning that gets sprinkled on mostly Mexican- style or Spanish-influenced dishes. 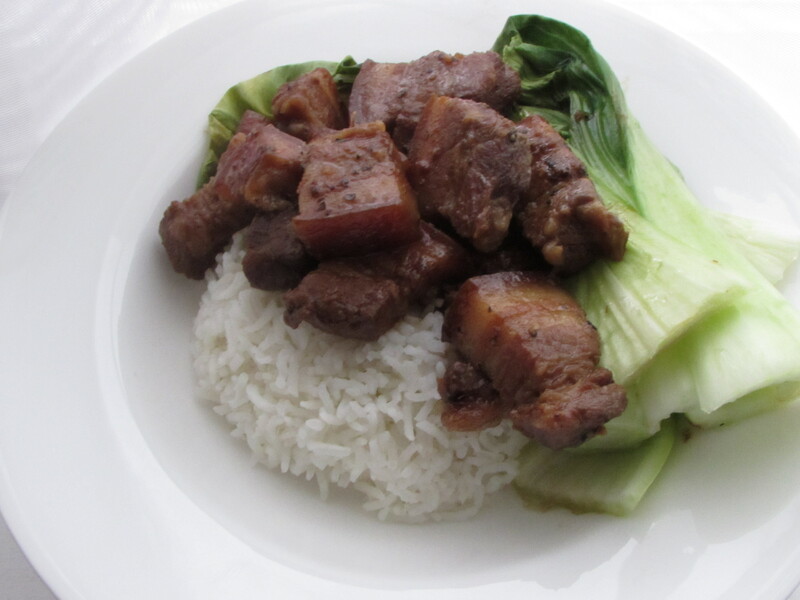 In the Philippines, however, the word adobo refers to a dish that is, arguably, the national dish of the Philippines. 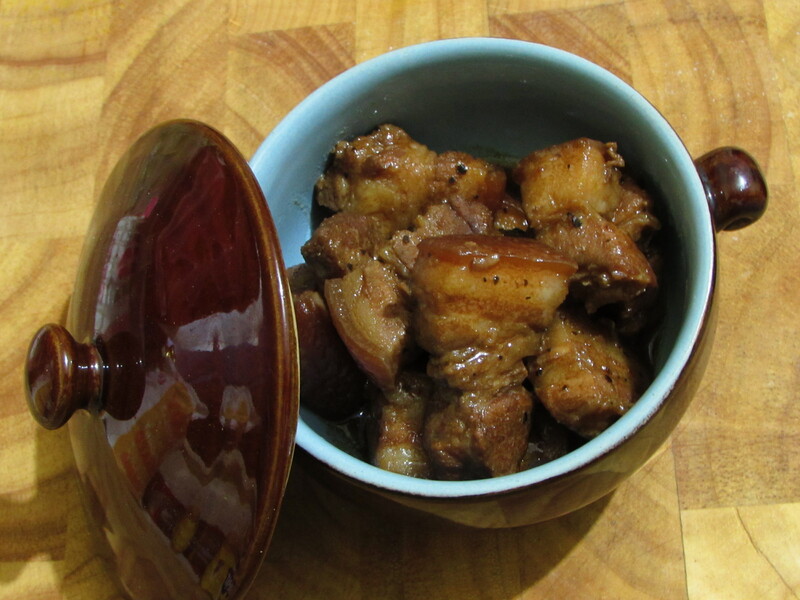 While adobo is a dish, it is called as such because it is a method of cooking: it is meat, vegetable or seafood marinated in soy sauce, vinegar and garlic, browned in oil and simmered in the marinade. 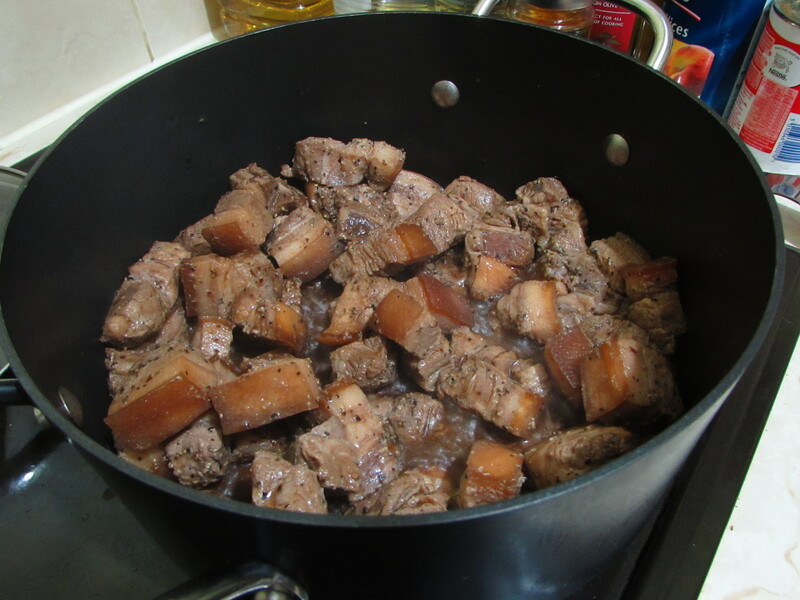 Before adobo was called adobo (prior to the arrival of the Spanish colonisers), our Filipino ancestors cooked food in vinegar, mostly to preserve the food and extend its shelf-life. Historically, the early Filipinos enjoyed a healthy trading relationship with the Chinese and as a result, soy sauce was incorporated into the cooking process. There isn’t really a set version of adobo because there are numerous versions of the basic recipe which, at its most basic, is vinegar, garlic and a salt alternative (most use soy sauce, but there are versions with just salt – which they say is closer to the original version of adobo, and some might even use patis or fish sauce), depending on the region in the country. I think it’s safe to say that each household has its own adobo recipe handed down in the family. Adobo is a dish that requires preparation – but don’t let that scare you. All you need to “prepare” is to cut up the meat and grab a big enough zip lock bag (other brands of zip-seal bags are available, of course!) . 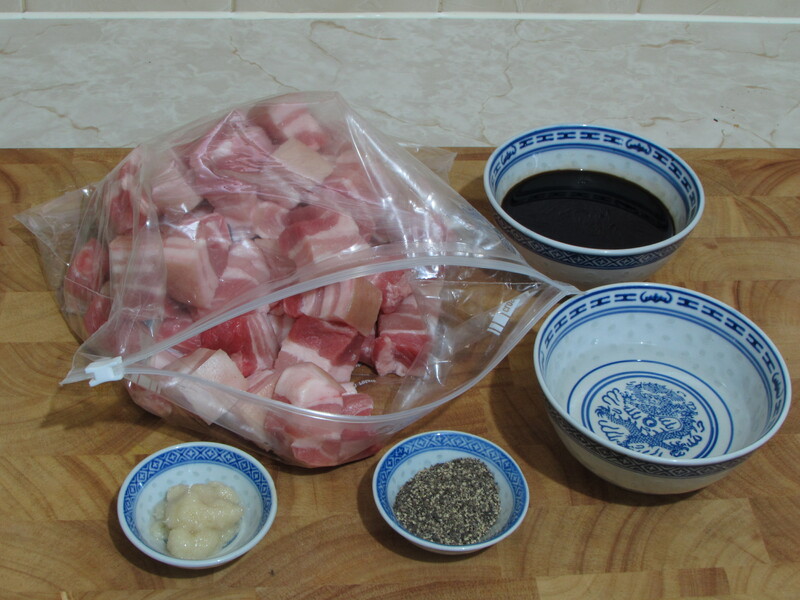 Place all the ingredients in the bag and gently massage the pork through the bag (gently, of course as you don’t want the bag to get any holes!). Once this is done, marinate for at least an hour. The longer the pork sits in the marinade, the better. Heat the oil in a stir-fry pan and add the meat pieces, making sure that you keep the marinating liquid. Brown the meat on all sides. Once the meat has browned, add the marinating liquid. Add the soy sauce, vinegar, sugar, the stock cube and water. 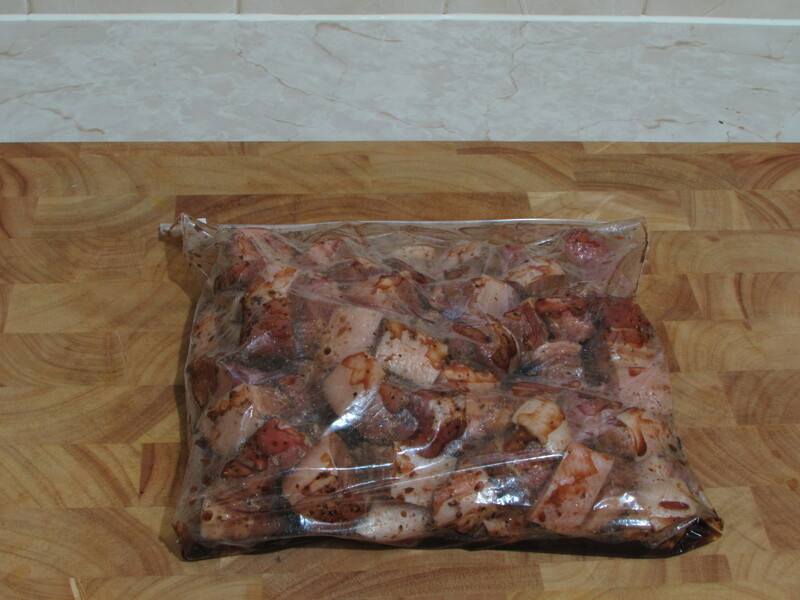 Make sure that the stock cube and the sugar are dissolved well and make sure that all the meat are covered by the marinating liquid. 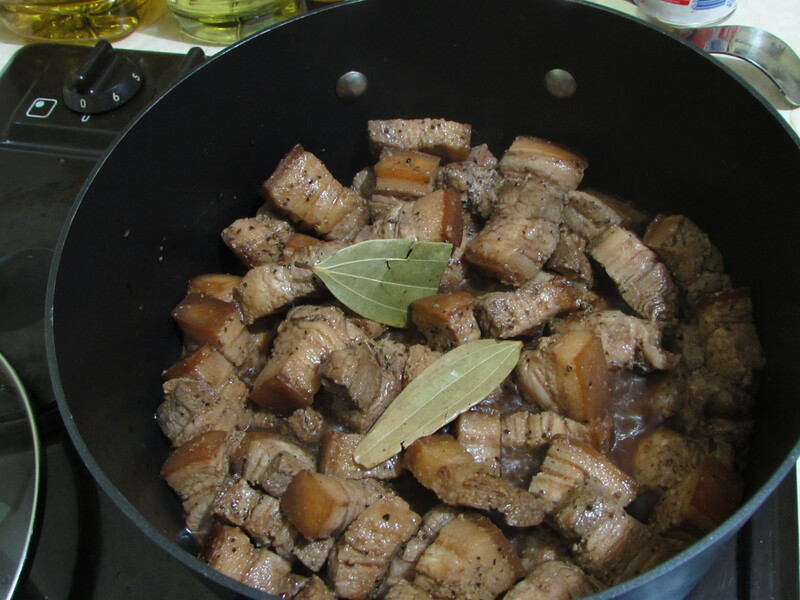 Add the bay leaves and cook for about 30-45 minutes or until the fat (if cooking pork) has rendered a little bit. Everyone has their little tricks to cooking their adobo. Mine is to keep the lid on and keep the pot over the hot plate (if you’re using an electric stove, or over the ring, if you’re using a gas range) for 5 to 10 minutes without lifting the lid. Serve over boiled rice or garlic fried rice with (or without) the vegetable of your choice!